The exhibition exposes various points of view of what it means for individuals when governments use scrutinized surveillance in the name of national security. The artists Jota Castro (Peru/Belgium), Minerva Cuevas (Mexico), Juan Ortiz-Apuy (Costa Rica/Canada), Marcos Ramirez ERRE (Mexico), and Regina Silveira (Brazil) will offer insights on how to adapt, control, rebel and live under surveillance. All eyes are on us today, as Toronto hosts the 2015 Pan Am and Parapan Am Games in the City of Toronto, offering a spectacle of wealth, sports and arts. Underneath the bewildering veil of prosperity and celebrations, the games will also bring heavier control over citizens invading privacy and obstructing notions of what a free society should condemn. This exhibition exposes the ‘observer’ and the roles are reversed. 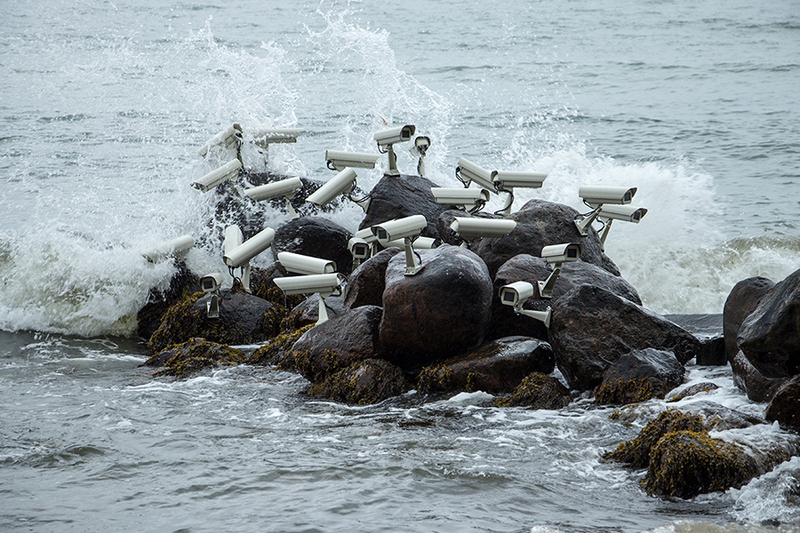 Instead, the eyes of the artist are on governments and their policies of surveillance. The artists in the exhibition offer an insight on the dilemma of having to negotiate the terms of the game, they provide guides to demonstrate, they create alternative modes of identification, they expose relationships between hemispheres, they question historical references and offer philosophical and metaphorical insights that help us survive an age of surveillance. State surveillance in Canada is on the rise. New laws and technologies have redefined the relationship between “public” and “private” spaces. Art can be a critical response to the process and impact of surveillance; it turns the modalities and technologies of surveillance inward, deepening our understanding of how surveillance affects relationships between the collective and the individual, the watcher and the watched, the object and the subject. This round table discussion explores the ways in which art and artists relate to expanding state surveillance. Drawing on historical, migrant, international, and diverse cultural perspectives we explore how surveillance and art are intertwined in the context of politics, law and resistance. (On a similar note, there’s also the Capturing the Space of Surveillance event at Inter/Access, suggested in your syllabus). Image is Jakub Geltner’s Nest 05.